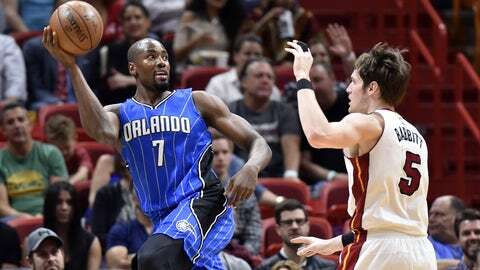 The Toronto Raptors have acquired Serge Ibaka from the Orlando Magic with an eye toward re-signing him beyond this season. It was clear that the Toronto Raptors were a piece or two short of contending. The team has been in a slide over the past few weeks and have struggled mightily on the defensive end of the floor. On Tuesday, the Raptors made a splash to try and turn their season around. The Raptors traded Terrence Ross and the lower of their two first-round picks, their own and that of the Los Angeles Clippers, in exchange for Serge Ibaka. Ibaka represents a seamless fit for the Raptors who could help swing the balance of power in the Eastern Conference. Acquiring Ibaka without giving up any of their three most important pieces in DeMar DeRozan, Kyle Lowry and Patrick Patterson is a big deal for Toronto. Ibaka addresses their shortcomings at power forward that have been present since Chris Bosh‘s departure. The position had typically been filled with hustle players or stopgaps. But now with Ibaka the team has a player that fits their exact needs at that position. With his rim protection and outside shooting, Ibaka can help open driving lanes for Lowry and DeRozan, while bolstering a porous Raptors defense. The deal is even more significant with the news that Kevin Love will be out for six weeks following knee surgery. Love’s injury is a huge blow to the Cleveland Cavaliers. Not only is Love unlikely to be 100 percent by playoffs, but this increases the load LeBron James and company will have to shoulder for the remainder of the season. If there ever was an opportunity for Toronto to make the Finals, it would be this year. The move also opens up minutes for Norman Powell. The second-year wing has shown tremendous promise as a three-and-D wing. However, while playing behind DeRozan, DeMarre Carroll and Ross, he simply wasn’t getting consistent minutes. The logjam is now cleared and he will have an opportunity to prove his worth. Ibaka’s presence gives the Raptors a variety of options when it comes to rotation management. He will obviously start alongside Jonas Valanciunas, but after that the team has tremendous versatility. Ibaka can help cover for Valaniunas’ terrible defense with the starters. He can also be paired alongside Patterson to give the team a two stretch-4 look that can also defend. They can even go heavy rim protection with both Ibaka and Nogueira. Sources: Toronto is trading for Ibaka with intention of trying to re-sign him in free agency this summer. Masai Ujiri has long coveted him. This could make for an expensive summer for the Raptors. With free-agent decisions looming for Lowry, Ibaka and Patterson. With time remaining before the deadline, it’s possible that the team looks to shed some salary in anticipation of this. Whatever they choose to do, it’s obvious that the team is now in a much better position heading into the playoffs.